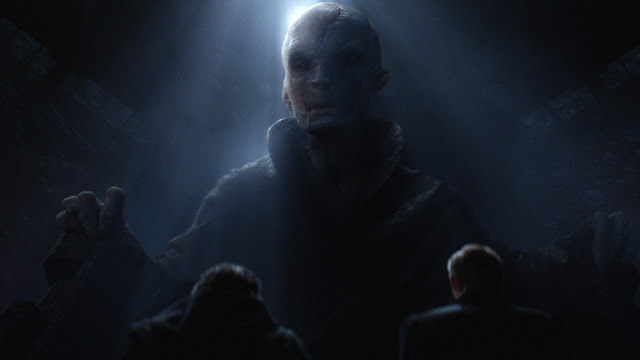 So, what wild theories do you have about Snoke? I love a mystery! There are so many theories floating around about Snoke, one of them is bound to be right…. right? But even though we didn’t see all that, it still happened, more or less, and it would make a great bridge between all three trilogies. But Andy Serkis himself has said, basically, that Snoke is just Snoke. Of course, ol’ J.J. is at the helm, and he is the king of smokescreens- he just dropped a movie in our laps no one had any idea about, and it comes out in two months. He tried and failed with Into Darkness, with the whole Kahn-is-not-Kahn thing. So maybe this is similar and he is just saying it to pull the curtain back later. For my money, though, Snoke is just that: Snoke. A new character, perhaps with ties to the old ones, but brand new. I think (more on this in a bit) we’ll explore his character and background more in VIII and IX. The only theory that makes any kind of sense is that Snoke is Darth Plagueis, which has a certain amount of cache for me, though I haven’t read the book from James Luceno to really see how Plagueis could better tie in. Of course, that book is already carrying the Legends banner, so we can’t take too much from it anyway. As cool as the deep-geek fan service would be if we found out Snoke was Plagueis, it’s boring. We already have to wonder what the hell Snoke has been doing during Palpatine’s rise to power and subsequent downfall, it would be even less plausible that Plagueis would continue to sit in the shadows after his apprentice attempted to murder him. One year on the sidelines after Palpatine, sure, but decades? Nah. We had better explore Snoke in the next two episodes (which may unfortunately mirror a bit of the Vader / Palpatine story from the original trilogy), but I think Snoke is just Snoke - a dark side user who is emphatically NOT a Sith. How old is Snoke, anyway? I suppose we’ll find out. Wookieepedia states that “Snoke witnessed the rise and eventual fall of the Galactic Empire”, and given that it’s been thirty years since Endor, he’s got some years on him. I know that since they’ve begun to set up that Rey’s parentage matters, we’ve probably already met them. Given Rey’s Force sensitivity and connection to Anakin and Luke’s lightsaber, there is a strong suggestion that Rey is a third generation Skywalker. The only thing I am less interested in than Rey being Luke’s kid is Rey being Kylo Ren’s daughter. I kind of think we haven’t met them- in that we never will. Or, at least, they are not as significant as we imagine them to be. Like Snoke above, there are no shortage of theories as to who her parents are- Skywalker, Solo, Kenobi, or some combination thereof. Organa-Solo: Leia and Han were both acutely aware that their son had turned to the dark side, and felt the pain of his failure and betrayal. Even if Rey had been hidden for her protection, no parent would be that invested in Ben’s redemption, but when their daughter shows up they had basically forgotten about her. If she was there kid as well, I am sure we would had a Yoda-esque “there is another” moment, jump cut to Rey, wink at the audience- at the very least. 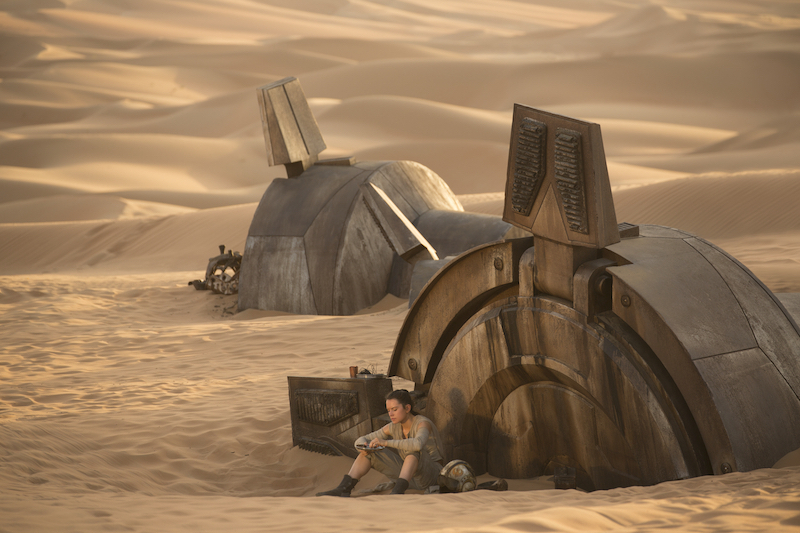 Also, it would be stupid for them to hide her on Jakku when her parents are, ya know, right there. Even if Kylo is hunting force-sensitives (and is determined to kill his sister), it’s not like he can just use his old house key to come get her. Of all the theories, this is the weakest. Skywalker: This is tied on the weakness scale, but it gets the edge for being more likely. I am going to be annoyed if this is where it goes, though. My argument against this is twofold: First, if Luke is trying to re-establish the Jedi order, it makes no sense that he decides to not only go against one of the Jedi Codes most basic tenants, not to mention the very one that led to his father’s downfall, by forming attachments. On the flipside, this could account for Ben’s turning, and Luke feeling like a failure and honoring the age-old Jedi tradition of running away and hiding from your problems (great job, guys! Jedi are stupid). Jedi are stupid, so maybe. Hey, Obi-Wan did elect to hide Luke on the friggin planet that Anakin was born / raised on, so let’s not discount the stupid here anyway. Kenobi: Damien G Walter hits a lot of these points against these, but arrives at the theory that she is a Kenobi (I might have supplied him with some of this, since I think it is the most likely). Basically, it goes like this: Obi-Wan and Sabine had an implied relationship in the Clone Wars TV show. If they had a kid ~30 years before the OT, this means that child had Rey in their 40’s or so (possibly with Skywalker). So the math works. It also makes sense as to why she is hidden somewhere other than where he decides to hide (sort of). So who is she? My money- also like Snoke- is that she is brand-new. And maybe we meet her parents, but I believe she is a student of Luke’s, whose parents we don’t really know (maybe they were in the Rebellion or something, a la Poe Dameron), and she survived the slaughter at the temple, as seen in her vision. The script shows clearly that Luke recognizes her, and why she is there. If she was his former pupil, grown and returned, offering him redemption for his own failure in the form of his old lightsaber and the awakened force, it is much more compelling than any of the other options. You know what I like as an idea? 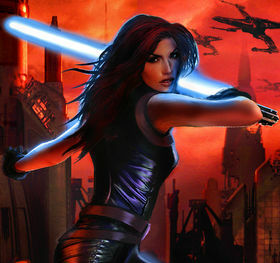 Mara Jade. But - still NOT Luke’s kid. I don’t know how much backstory they’d want / need to give for a “hidden wife / lover” for Luke or if they’d really get into Mara Jade being the Emperor’s Hand (and then missing for decades? ), but that could give nice fan service for long time readers while presenting something new in the movies. And while I would be somewhat disappointed that she didn’t marry Luke and together they raised Ben Skywalker (not Ben Solo, this still doesn’t make sense because Leia and Han never had the connection with Obi-Wan that Luke did - if anything Ben Solo should be named Bail Solo), I would very much appreciate the nod to the now discarded Expanded Universe. Something else that would be interesting: Rey is Boba Fett’s kid. I have nothing to back support this, just a random idea. Oh. Back to Mara Jade. Do it like this: She was one of Luke’s students in his New Jedi Academy school thing that he founded after Return of the Jedi. She, with another student (or not, I don’t care), had a daughter. Ben Solo turned, killed that particular class of students, and Luke hid Rey on Jakku rather than take her with him when he ran and hid. I really like this idea a lot, too. Something that is a nod to the fans, that is not completely shoehorned in to fit, is perfect. Also, I have seen chatter about her being Palpatine’s kid gaining traction. Which… no. Just, no. It would be far too shoehorned. Do what Joe says, people. Apropos of Boba Fett: I don’t want Boba Fett to come back - and you will not find a bigger Fett fanboy than me, but that’s just it: I want a new Fett. We’ve probably all seen the (excellent- I’m not knocking it) fan trailer, but instead of Boba coming up from the pit, show him in the pit, with his last breath he pushes a button on his wrist, cut to Slave 1 and another Fett clone opens his eyes. The First Order will increase their offensive, despite the loss of Starkiller Base- they still have a fleet, and just wiped out the capital of the Republic. I believe we’ll get a good dose of Hux and Phasma wrecking Republic worlds early. 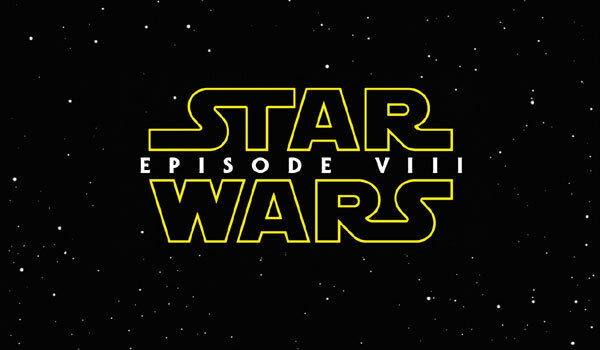 The film will start after Rey’s training is in full swing. Early in the film, we will get Luke alluding to his own failure and the events which lead to Rey’s being on Jakku and Ben turning. Then we will see Kylo and Snoke. I think this is where we learn who/what Snoke is, and more about his motivations- and what the hell happened to him. Since it has been made clear that Kylo, at the very least, is not Sith, it is possible that Snoke follows a Revanite path. Or, possibly, that he is Plagueis. Either way, I think through this we will get more and more of Snoke’s plan. On that note, I think Snoke is going to be the most evil character in Star Wars Canon. While we have seen Han die at his sons hand, there are other kinds of pain- and I fully expect Snoke to explore them in Episode VII. I doubt we will see a major (light side) character die, but I think we will see them suffer- even worse than our heroes did in V.
I think Finn comes into his own. In Before the Awakening, he is presented as a great stormtrooper, with a lot of martial skill. I think we see him become a leader in the Resistance. He probably meets his family, too. And then they die. Rey will likely embrace her power- possibly rushing for a rematch with Kylo, this time being beaten, as with Luke and Vader in V. She loses her hand, because that is what happens in Star Wars. I have two theories re: Luke. First, Luke become fully realized in this. Luke is my least favorite character ever, because he whines his way through everything and is terrified of failure. By the end of this film, I believe he will confront his former student and throw off his fear and weakness -possibly buoyed by Rey’s strength and confidence (god, I love Rey). I would assume, given how central Kylo is to everything, that he does not die (also because Jedi, like, never kill anyone when they should. Jedi are stupid), but it would be powerful for Luke to have to kill his former student (with Leia looking on)? Alternately, in the Luke/Kylo showdown, Luke gives in to anger and kills Kylo, and ends up joining Snoke on the dark side. Seems less likely, but- it’s a thought. Maybe he shouldn’t whine so much. Either way, I want Leia to get some redemption/revenge in this- She is the opposite of Luke- quietly strong though four films and counting, dealing with the loss of (in order) her homeworld, adoptive parents, father, son, brother, husband, son again. OOOOF. not to mention she got stuffed in a bikini and licked by a Hutt, which is no one’s (rule 34 excepted) idea of a good time. So either in VIII or IX, I want to see her just own, either as a general leading a military victory, or picking up Luke’s saber with a stern “I’ll do it myself”. Poe does lots of awesome things, because Poe is awesome and perfect. Also maybe he dies? I think the film ends on a vague, hopeful note- possibly with the Resistance growing, but the only ones of the heroes left standing are Leia, Rey and Finn. Hey, look, I can do bullet points, too! What if Starkiller base was just a side project? I know the First Order can’t be *that* big, but what is Snoke is doing his thing and General Hux always wanted his own Death Star, so that’s why it was built. We already know there are factions and possibly clone troopers still in existence, so Starkiller doesn’t to be the whole show. It also shouldn’t come back in Episode IX, either. This is more for Episode IX, but Luke dies in the end. I know, I know that Han was the big death, but Luke can die heroically in battle. Please don’t turn Luke. I know they did it in the Dark Empire trilogy with Palpatine’s clone, but let’s not do that. He was strong enough as a young man to resist and to turn Anakin back to the light (which doesn’t excuse his crimes), and even though years and decades of sorrow and pain can cause a man to turn when he wouldn’t as a brash and humbly arrogant young man, don’t turn him. Let Luke and Rey stay. I want to know more about Leia’s Jedi training. Sure, it’s possible that after Endor she told Luke that she doesn’t have time to train (which seems mostly right), she should still have had some less formal training sessions. I want to know if Kylo Ren just happened to murder Luke’s first / only class or if there are actually more trained force users out in the galaxy trying to do good. I don’t know when young Ben Solo started training, but there are some unanswered questions here about the state of the Jedi and light side force users. We need to see Leia and Chewbacca’s grief beyond those first moments when she felt and he saw Han’s death. Also, if Chewbacca had a Life Debt to Han, what happens next? Does he have a family back home? (the books say yes, will the movies?) Do we go back to Kashyyk for any reason? 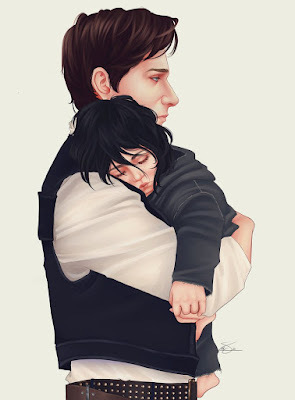 There has been some wonderful fan art coming out of The Force Awakens, and I have to wonder how much of this would have gut punched me if I wasn’t the father of a now one year old boy. The above piece from Orisoni absolutely crushes me in ways I would never have expected, but holding my son I think about who he is going to grow up to be, about raising him to be a good kid and a good man, and about how we don’t really have control on how our kids are going to end up. We can only give our children all the tools and love and support we are capable of and hope that they will make good decisions with those choices. We don’t know what Ben Solo’s upbringing was actually like, but the thought of my child turning into Kylo Ren is unimaginably painful. Then, I think about my niece and Tyson Murphy’s Chewbacca / Kylo Ren comic and there I go again (Chewbacca is totally Kylo’s uncle, and it’s a pain that the movie only touches on briefly and directed towards Han and not Kylo, but you know Chewbacca has been grieving all this time, too). *choking sobs* A thing I have said for a long time is that the best part of Star Wars is what it doesn’t show us- see my love of a character with five lines. Kylo/Ben is a big part of this. We don’t see Ben grow up, but our imaginations take it to dark, heartbreaking places. As another small aside, Han reaching out to touch Ben’s face as he dies is possibly the most perfect moment in modern film. Joe Sherry - Writer / Editor at Adventures in Reading since 2004, Nerds of a Feather contributor since 2015. Minnesotan. Dean - Dean is the author of the 3024AD series of science fiction stories (which should be on YOUR summer reading list). You can read his other ramblings and musings on a variety of topics (mostly writing) on his blog. When not holed up in his office tweeting obnoxiously writing, he can be found watching or playing sports, or in his natural habitat of a bookstore.